Plemons started life in 1898 from a dugout built by rancher James A. Whittenburg. 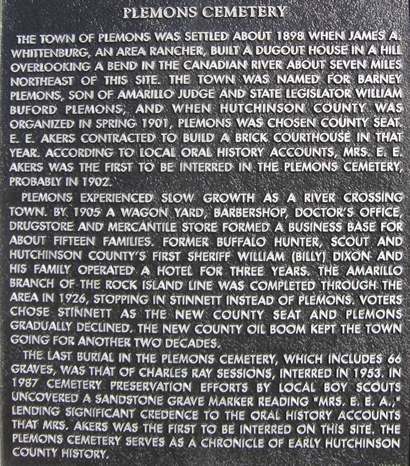 The site, however, was named for Barney Plemons, the son of William Buford Plemons, an Amarillo judge and state legislator. In 1901, Plemons was chosen as the Hutchinson county seat and a post office soon opened. A small frame structure served as a courthouse until it was replaced by a two-story frame building later that same year. In its first seven years, Plemons became the home for an estimated 15 families. 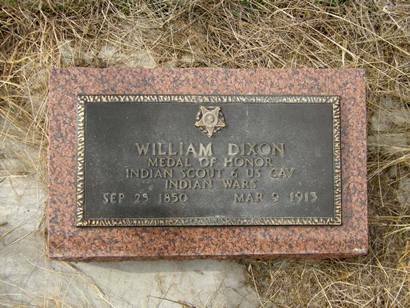 The town’s most famous resident was William (Billy) Dixon, the former buffalo hunter, who became the first sheriff of Hutchinson County. The town was bypassed by the railroad (the Amarillo branch line of the Rock Island Railroad) and started into a decline. In 1926 Stinnett , which was on the railroad, became the new county seat. The discovery of oil kept Plemons alive for another 20 years, but the population was down to 100 people by 1940 and only three businesses were reported. The post office closed in 1952 and today only the cemetery and historical markers mark the former town.